18 Time AALBC.com Bestselling Book! In the waning days of Indian Territory, the multi-racial, teenaged Rufus Buck Gang embarked on a vicious, childish, and deadly 13-day rampage that shocked even this lawless place. Their goal was to take back Indian lands. Based on the true story, this is a tale of how real-life figures "Hanging Judge" Isaac C. Parker, notorious half-black, half-Indian outlaw Cherokee Bill, one-quarter Cherokee "gentlemen bandit" Henry Starr, relative of the notorious Belle Starr, and the worst of them all, half-black, half Indian Rufus Buck, collided during the summer of 1895. In lawless Indian Territory the end of an era approached. The U.S. government continued to co-opt Indian land for settlement. Judge Isaac C. Parker's judicial tyranny over 74,000 square miles of Indian Territory was coming to an end. Against this background, the teenaged Rufus Buck Gang embarked on their mad quest to reclaim Indian lands from US settlement. Rufus is guided by a sense of religious mission, by heavenly visions made manifest in the form of the extraordinary, 13 year-old Theodosia Swain. With his angel to guide him, he sets out to do the impossible with a missionary's zeal, a child's anticipation, and a grown man's violence. In "I Dreamt I Was in Heaven," famous, historical figures dance with fictional characters to create a turn-of-the-century tapestry of violence and innocence, love and betrayal, butchery and grace--mirroring and chafing against the backdrop of a burgeoning United States, and a disappearing American West. 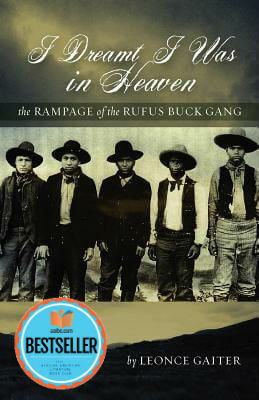 Tell us what do you think about I Dreamt I Was in Heaven - The Rampage of the Rufus Buck Gang.